There’s no doubt we’ve been super busy this month. We’re ice-skating on Wednesdays, our school had Crazy Hat and Hair Day this week and we’ve just had two fun Winter celebrations in our class, Valentine’s Day and Chinese New Year. Valentine’s Day generated a lot of excitement this year in our classes. We made some crafts, read a few Valentine stories and held a Valentine card exchange. We made Valentine card holders out of paper bags and decorated them. In the days leading up to Valentine’s Day the children brought their Valentines for each other and placed them into the appropriate bags. Our only restriction is that each student, if he or she wishes to give out the Valentines, gives to all the girls, or all the boys, or everyone. We stapled up the bags to send home as many of the cards had sweets attached to them. As each family has their own rules for the consumption of candy, we thought it best to let moms and dads decide with their children. 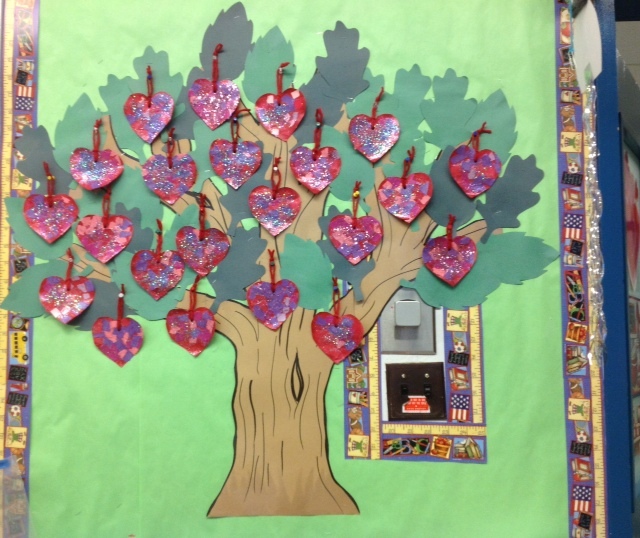 In our class, Valentine’s Day is all about Friendship, and that is illustrated so well in the book Franklin’s Valentine by Paulette Bourgeois. Franklin’s Valentines fall out of his unbuckled backpack and he’s sad and disappointed, thinking his friends won’t give him a Valentine if doesn’t have any to exchange. Franklin’s friends all have special cards for him, and he learns that friendship is not about the cards, but the caring and kindness of others. We had a small party and enjoyed a delicious snack of fruit and veggie trays and cupcakes and cookies, all supplied by our generous parent group. Gung Hay Fat Choy! It’s the Year of the Goat (or Sheep, depending upon your calendar). 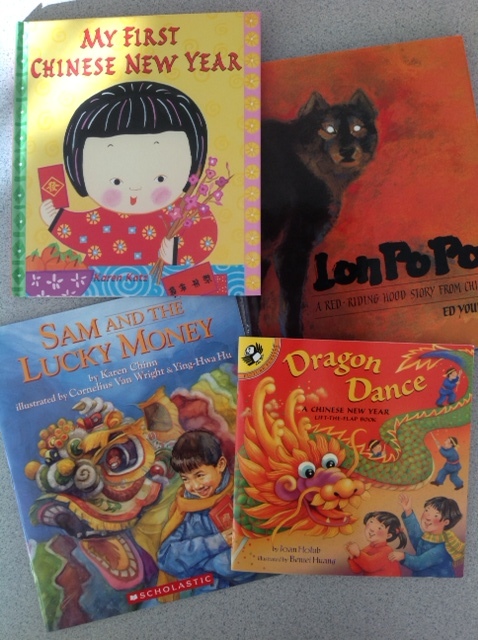 We’ve enjoyed sharing some excellent books about Chinese New Year with our students, which have focused on the traditions and symbols of this special time spent with our families and friends. We kicked off our celebrations on Chinese New Year’s Eve with oranges and “ly-cee” bags, the special red envelopes, donated from one of our families. Mrs. Kennedy, our teacher-librarian, started reading The Runaway Wok with the Kindergarten and will finish our story next week. 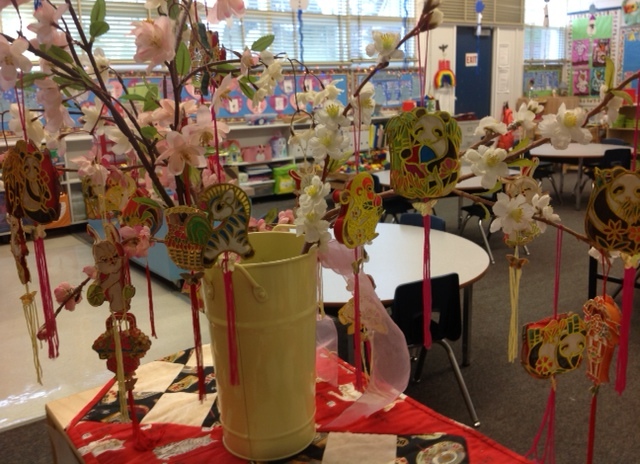 We decorated some pretty flowering branches to symbolize the upcoming spring and all things new and growing. 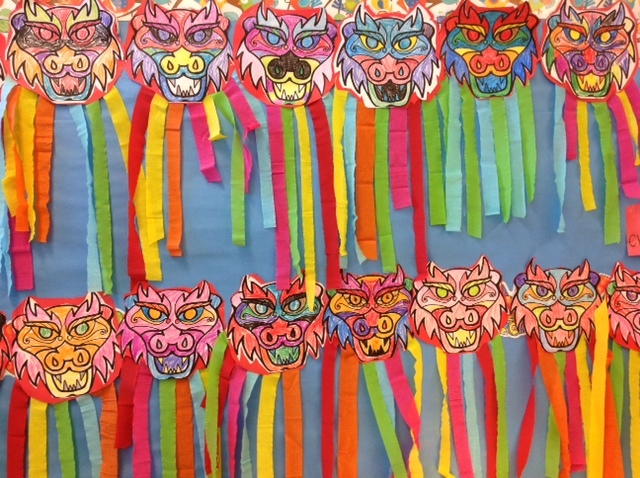 We made Chinese dragons in Art, like the dragons in the Chinese Dragon Dance. We celebrated Chinese New Year’s in our classes on Friday. We read the amazing book, Lon Po Po, by Ed Young. It is similar to the fairy tale, Little Red Riding Hood, but set in China. We illustrated our favourite part of the story in pastel, and we’ll give our pictures a watercolour wash next week. Then we’ll cut the pictures into panels and back them onto construction paper. This Chinese art form will be similar to the pictures in Lon Po Po, where the illustrations are featured as panels. The Chinese New Year banquet is of great importance, as food is in all of our great cultural celebrations. 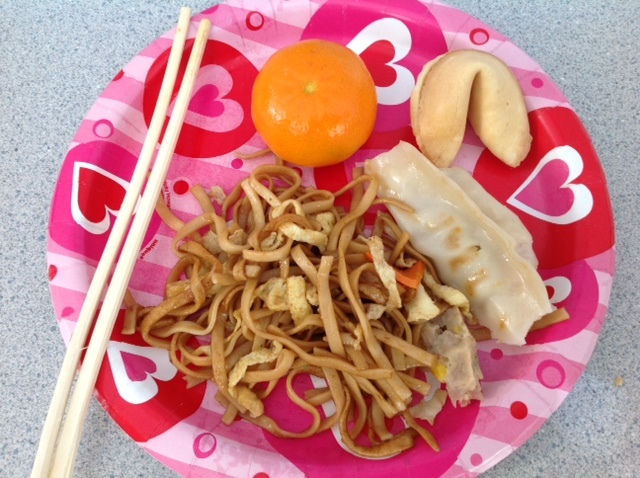 For the Kindergarten, we ate a delicious Chinese New Year’s “snack” provided by our wonderful parents. We ate noodles for a healthy, long life, and dumplings. We ate oranges, which stand for prosperity and good luck. And of course, what makes a Chinese meal for the children? Fortune cookies! 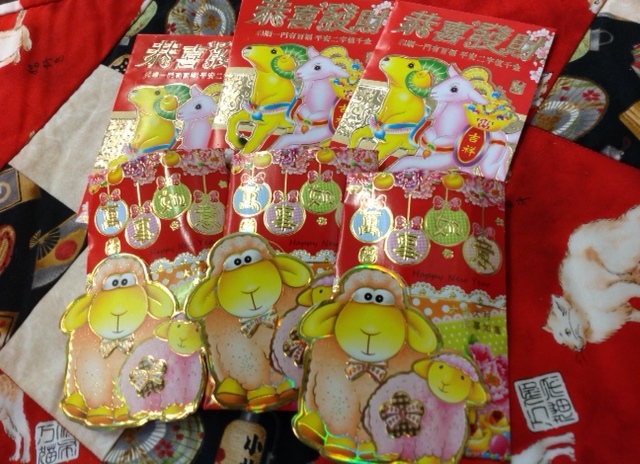 And we had “ly-cee,” the special red envelopes which symbolize prosperity, filled with a special candy. Thank you so very much to all of the families who donated food and their time to support our Kindergarten program. Gung Hay Fat Choy to all of you, good health, good luck and prosperity in the New Year! This entry was posted in Classroom Chatter, Holiday Fun by thekinderteam. Bookmark the permalink.